This is where the high speed train idea originated. Your thoughts? The NAACP wants the UN to address the Missouri situation. Is anyone else concerned that so far we really have no facts about this? NAACP Goes to the UN? August E-News: Part Two, Much Climate News to Impart! We couldn't contain ourselves to just one E-News blast this month. So much climate news! The good news is that the momentum is with us. To keep that momentum building we need your help. Please scroll down and check out the exciting activities going on and take part how ever you can. Join us! Have Fun! And Make a Difference! 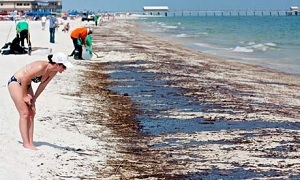 Stop new oil and gas leasing off Virginia's Coast! Check Out NEW Sierra Club Calendar Online! Want to Have a Bigger Say in How Virginia is Governed? 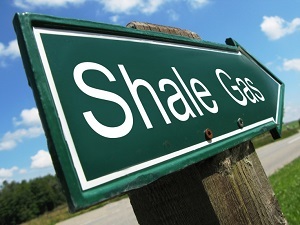 Attend a Workshop this Summer to learn about Fracking, regulating Greenhouse Gases, and more! Building a Winning Climate Strategy for Virginia! Our Annual Gathering Sept 26-28 - Just Around the Corner! 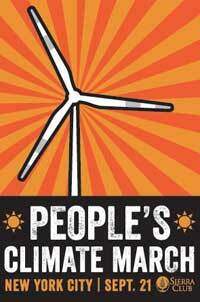 Be a part of History: People's Climate March in NYC Sept 21! Offshore drilling is not only dangerous to our oceans, marine life and people, increasing offshore oil drilling will accelerate climate change. If we are serious about avoiding the most catastrophic impacts of climate change, we have to keep dirty fuels like oil and gas in the ground. Yet, the Obama administration is setting the stage for future oil drilling in our oceans from the Arctic to the Atlantic over the next several years. Click here to tell the administration to say "NO" to new leasing for gas and oil in America's oceans. Act Now! Deadline for public comments is Aug. 15. Want to find out what hikes are being organized near you? Curious about where we’ll be waving signs and demonstrating next? Maybe you want to meet other environmentalists over drinks, or watch a documentary film about fracking. Now, you can find all this and more in one easy location! Visit the Virginia Chapter of the Sierra Club online, and navigate to our Events Calendar. You can find it HERE. Enjoy! If you are interested in talking to your elected officials about our environment, join us to learn how you can build influence with your state Senator or Delegate as a Sierra Club Citizen Lobbyist. Experienced advocates and beginners are all welcome. We’re coming to a location near to you! Click the link below for more details about the workshop closest to you. Virginia is at an energy crossroads. We can choose to maintain the status quo of energy production focused on unearthing our energy fuels or we can choose to reduce air pollution, minimize climate change effects and use modern technology to develop clean energy solutions. Please join the Virginia Conservation Network, Virginia League of Conservation Voters Education Fund, Virginia Sierra Club and our local partners as we explore Virginia's path to a clean energy future. Most importantly you can find out what you can do to promote clean and renewable energy policies here in Virginia. To RSVP, visit www.vcnva.org or phone 804-644-0283. Climate Action Workshop: Building a Winning Climate Strategy for Virginia! 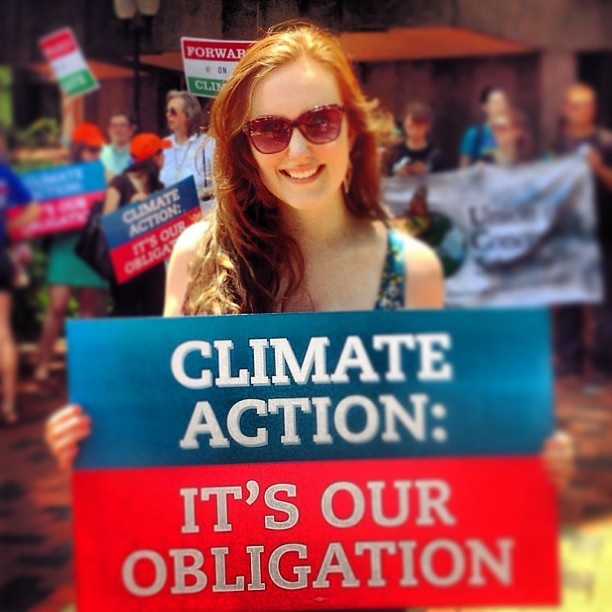 The weekend of August 23, 24 in Richmond, the Sierra Club is joining forces with VA Conservation Network and our other allies for an exciting Climate Action Workshop. If you are passionate about climate protection and committed to action, then we urge you to sign up. We'll cover hotel and meals-- we just ask that you pay $10 at the door to help defray expenses. So become a part of the Virginia Climate Movement and sign up today. For more details, click here. 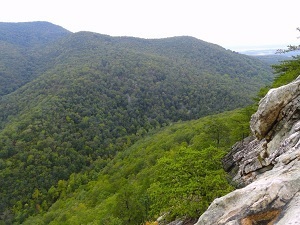 Every year Virginia Sierra Club members and friends join together for a weekend of hiking, music, fun and, of course, learning about how to protect our natural environment in Virginia. This 3 day, 2 night gathering includes nature hikes, Virginia Sierra Club happenings, great music and fellowship. If you've never been this is the year to try it out and for those veterans this is a year you won't want to miss! The People's Climate March! Let's Make History! Join us for the People's Climate March in New York City on September 21. The People's Climate March--held just days before the United Nations Climate Summit--is an unparalleled opportunity to let our world leaders know how urgently the public is calling for solutions to climate disruption, and how we need to move quickly from dirty fuels to clean energy. Besides, it just might be the biggest public outpouring of support for climate solutions this planet has ever seen. The People's Climate March is going to be a big deal. RSVP now, and keep checking back for details on special trains and buses that might be leaving from your area. There are over 325 local, national, and international organizations participating in the People's Climate March. See a list of our partners. WHO: Sierra Club, tens of thousands of passionate and dedicated allies, and you! Interesting? Posturing for 2016 or something else? Your thoughts? E-News: No Dog Days of August. Climate Summer is here! August may be another scorcher but there is not much time to lounge in the shade on the environmental front. In fact this entire summer has been intense and hopeful for action on climate time! Since June there have been nine public hearings or listening sessions on clean energy and climate held by the State of Virginia from one end of the Commonwealth to the other. The good news is that we out-numbered the climate skeptics and Big Coal by 10 to 1 or better at almost every one of these sessions. There is no letting up in August either, so please keep reading and clicking! Tell the VA State Corporation Commission that they should not let our electric utilities impose a "Tax on the Sun" for their customers who put solar panels on their homes. In Arizona, the utilities there sought a $100/month charge on customers with solar panels. Dominion already has a $50/month tax on larger home solar systems and AEP is seeking a similar tax. These utilities are considering Arizona-style legislation in the 2015 General Assembly Session that would expand the tax to all solar home systems. This cynical effort to stifle competition needs to be stopped now! Click here to take action NOW! Here is your chance to make new friends and meet other Sierra Club volunteers and leaders in the great outdoors in the heart of the George Washington National Forest. Register before August 5 for the Early Bird Discount! 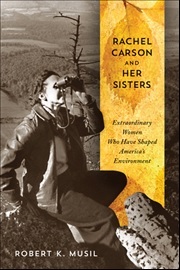 The weekend also includes special keynote remarks on Saturday evening from ROBERT K. MUSIL, President and CEO of The Rachel Carson Council, Inc., senior fellow at the Center for Congressional and Presidential Studies, American University, and author of Hope for a Heated Planet. He is the former CEO of the Nobel Peace Prize–winning Physicians for Social Responsibility and an award-winning journalist. Along with the Koch Bros, the America Legislative Exchange Council (ALEC) spends millions on right-wing causes from fighting climate change to "stand your ground" laws to voter suppression. 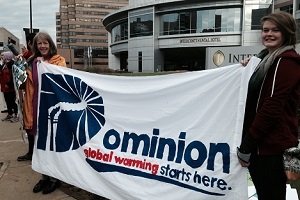 Dominion, Virginia's largest public utility is a member of ALEC and we think that's wrong. Just last week ALEC had their conference in Dallas where they strategized how to block the EPA Clean Power Plan to reduce carbon pollution. You can tell Dominion CEO Tom Farrell to quit ALEC by clicking here. Additionally, you can join us on Thursday, noon, September 4, at a demonstration outside ALEC's HQ in Arlington, VA. Click here to RSVP TODAY! If more people voted, there would be less pollution. We know most folks support environmental and climate protections, but not everyone votes. Right-wing groups like ALEC and VA Senator Obenshain want to make sure it is even harder to vote by throwing up more barriers to voter access. You can stop one of these assaults on voters rights in Virginia by clicking here! If you missed Senator Chap Petersen singing Sweet Home Alabama in front of a live band, craft brews with Delegate Ron Villanueva, or the solar tour of Eastern Mennonite’s campus with Senator Emmett Hanger, you’ll want to save the date for Sierra Club events with the remaining six 2014 Legislative Leader award winners. Coming up in August we’re celebrating our friendship with two additional legislative champions, and you don’t want to miss out! Join Delegate Kaye Kory (D-38) on Tuesday, August 5, at 6:00 PM at the George Mason Regional Library. Click HERE to learn more and RSVP! On Wednesday, August 13, at 6:00 PM, the Sierra Club will be joining Senator David Marsden (D-37) at Burke Center Library. Click HERE to learn more and RSVP! Four other legislators are being recognized this summer by the Sierra Club for bills they carried during the 2014 General Assembly Session, including Sen. Tommy Norment (R-3), Sen. Richard Stuart (R-28), Sen. Mamie Locke (D-2) and Delegate Christopher Stolle (R-83). You can read more about the legislator awards program on our website, HERE. 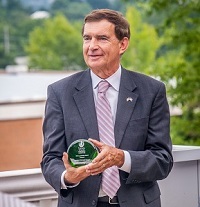 Pictured on the right is Sen. Hanger with his Sierra Club legislative award. Climate Action Campaign: Engage Virginians in the national movement to address climate change and increase our use of renewable energy. Key issues include: reducing carbon pollution from power plants, defending the Clean Air Act, encouraging key decision-makers to support the President’s Climate Action Plan, and moving our communities and utilities away from reliance on fossil fuels. Virginia General Assembly In-District Legislative Power Building: Work with Sierra Club volunteers and others in key legislative districts to build power and advance legislation to fight climate change, advance solar and wind energy and protect our air and water. Internship positions are limited and spots fill up quickly. Preferred application deadline: August 18, 2014. 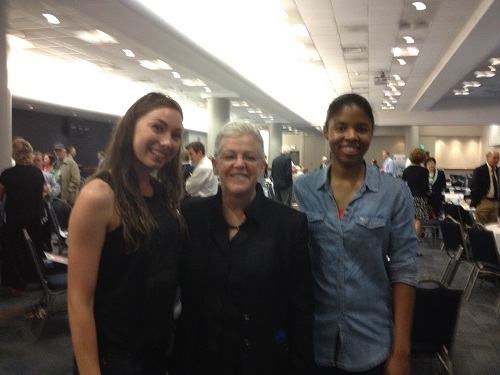 Pictured here with EPA Administrator Gina McCarthy are Brenna Perez and Imani Burton, Old Dominion University students and Sierra Club summer interns working in the Norfolk office.